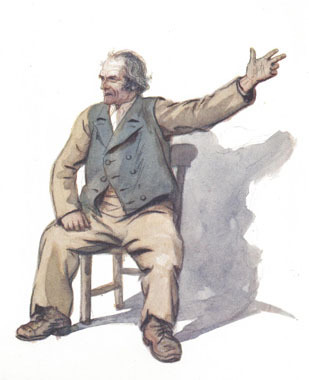 For many centuries, Irish storytellers—seanchai (pronounced: shanachie)— have captivated listeners with tales of local history and ancestral lineages. These storytellers have inherited their knowledge and craft from generations of seanchaidating back to the pre-Christian bards of the Druids. Because of them, genealogies of many Irish clans survived until they were captured on paper during the nineteenth century. In pre-television and radio days, the long Irish winter nights were spent gathering at favorite community households for entertainment. Singing, dancing, and storytelling filled the evenings for rural laborers. The custom was called visiting, or ar cuairt. 1 The highly respected seanchai were present during ar cuairt, and though the people were there to be entertained, they also realized the important position of the storytellers in keeping genealogies alive. When Irish emigrants took their culture with them to their new homes on foreign shores, they often found time to continue the storytelling tradition with their children and grandchildren in order to preserve their past. Some passed on oral clues of family origins in Ireland, while others recorded the stories for their posterity. Most of us inherit family stories, but how do we know if they’re fact or blarney? One such story survives today in three distinct descendant lines of John Doherty of County Tipperary, Ireland. The actual chronicler of the story is unknown, but the seanchai in this case was Mary Ann Conklin, daughter of James Conklin and Margaret Doherty. Making the effort to prove or disprove a story may lead to new ancestors and a greater understanding of your family. The Doherty story is nearly proven, with minor corrections of details, as discussed below. Italicized items in the discussion are quotes from the story and are not in sequence, but are listed in logical research progression. Charles Doherty, soon after coming to America, settled in Detroit. He married Mary Pickett. They had five children: John, Mary, Frank, Richard and James. Margaret Doherty married James Conklin of Deerfield, Livingston County, in 1844. Once again, a census search was conducted. James and Margaret Conklin were found in Deerfield Township, Livingston County in the 1850 and 1860 censuses, and Margaret was found in the 1870 census.8 A book of cemetery records for the county listed Margaret Conklin buried in Saint Augustine Catholic Church Cemetery. Margaret died 1 March 1879 at age sixty-two. The person listed above her in the book is John Doherty, who died in 1854 aged ninety-four years9-an added bonus as the family story doesn’t mention that John immigrated! John and Margaret’s tombstones list their place of origin as County Tipperary, Ireland, information not included in the transcribed county cemetery records. Nicholas, Edmund, and James came to America in 1834. After considerable investigation, they settled in White Lake Township, Oakland County, Michigan. The young men had quite a nice little sum of money when they left Ireland, but they took up a section of land from the government, and spent the money with such a lavish hand that they soon found themselves in straitened circumstances. Another item found was The Sesquicentennial of St. Patrick Chapel and Cemetery, 1840-1990. It contains sketches of pioneers including the Dohertys and neighbors James Crotty and William Gorman. The accounts indicate that the Doherty brothers traveled from Ireland with Tipperary neighbors Crotty and Gorman. With those names, the index was revisited and the passenger list was found for the SS Victoria.12 It arrived in New York harbor 3 May 1834 from Liverpool. Enumerated on the list were Edmond, Nicholas (whose name could easily have been mistaken for “Mrs.” as it is listed in the index), and James Doherty, James Crotty, and William Gorman and family. James enlisted in the Army, and went to the Black Hawk War. He was never heard from again. The Black Hawk War took place between April and September 1832,15 making James’ participation impossible. His last known land transaction was in November 1837, so the U.S. Army enlistment register was searched from that period forward. He enlisted in Detroit on 25 April 1838. His enlistment record states he was born in County Tipperary, Ireland, was twenty-one and a shoemaker. This is the only James Doherty of any spelling to enlist from Detroit between 1837 and October 1850. A search of the muster rolls for his unit (Company H, 5th Infantry), showed that James Doherty died at Fort Winnebago, Wisconsin Territory, 5 June 1838, less than two months after he enlisted.16 No cause of death is listed. It is possible that James’ brothers never knew he died so soon after enlisting. Captain John Doherty, Regiment 38, British Army, was at one time stationed in Galway. Here he married Mary Lynch, daughter of Barrister Lynch, and granddaughter of Judge Lynch. After some years Captain Doherty sold his commission, and retired to his estate at Tipperary. “Outra” was the name of the estate. Captain Doherty had a brother, Nicholas Doherty. His estate was adjacent to Captain Doherty’s….Captain John Doherty’s estate, being left entirely to the management of hired help, began to show signs of mismanagement. The Tithe Applotment Book, dated 1 November 1825, and the Tithe Defaulters List, dated 1831, show John Doherty, Esquire, living in Outeragh, Outeragh Parish, County Tipperary, adjacent to Mrs. N. Doherty, apparently the widow of John’s brother Nicholas. Griffith’s Primary Valuation shows John Doherty, Esq. living in the Outeragh House, the manor house for the overseer of the property owned by a Colonel Palliser.22 At some point in the mid-1840s, John Doherty relocated from Outeragh to Cashel and according to a descendant, “lost his estate in dickering in fast horses.”23 The estate was not John’s to lose, however, so it is more likely that the Palliser land owners either lost confidence in him or wanted their land watched over by a younger landlord-John was in his eighties at that point. Captain John Doherty had six children: Nicholas, Edmund, Charles, Matthew, James, and Margaret (1817). The mother died when the family was still young. Margaret spent three and a half years in the Ursuline Convent in Thurles. While proof for every item in this story has not yet been accomplished, the trail to discovering answers to the clues has led to a plethora of new cousins, new ancestors, and new leads. Similar methods can be pursued for any family story, regardless of nationality. The key is to learn about the types of records that are available for the location and time period in question, and to explore in depth what records could have been created for the events mentioned. Understanding the history of an area and the culture of an ethnic group also helps to unravel family mysteries. Today’s genealogists continue a centuries-old tradition of telling the tales of our ancestors so they will not be forgotten. Elizabeth Kelley Kerstens, CGRS, has been in search of her ancestors for more than twenty years. She is the editor of the APG Quarterly and the creator of Clooz-the electronic filing cabinet for genealogical research. 1. Clodagh Brennan Harvey. Contemporary Irish Traditional Narrative: The English Language Tradition. Berkeley, Calif.: U of California P, 1992:7. 2. 1900 U.S. Census, Detroit, sheet 1, E.D. 107, dwelling 2, family 2, T623, roll 751; 1910 U.S. Census, Detroit, sheet 7B, E.D. 247, dwelling 32, family 33, T624, roll 680; 1920 U.S. Census, Detroit, sheet 3A, E.D. 17, dwelling 42, family 52, T625, roll 816. 3. 1900 U.S. Census, Detroit, sheet 14, E.D. 91, dwelling 300, family 320, T623, roll 680. 4. 1880 U.S. Census, Detroit, p. 48, E.D. 295, dwelling 456, family 473, T-9, roll 613. 5. 1860 U.S. Census, Detroit, p. 68, dwelling 572, family 537, M653, roll 556; 1870 U.S. Census, Detroit, p. 201, dwelling 1568, family 1523, M593, roll 715. 6. Charles E. Clark. Annual Directory of the Inhabitants, Incorporated Companies, Business Firms, Etc., in the City of Detroit, for 1862-3. Detroit: Charles F. Clark, 1862:189. 7. Charles Doherty; A Co., 15th U.S. Infantry; Invalid application #163547, certificate #411267; Widow app. #314418, certificate #248361; RG 15; National Archives. 8. 1850 U.S. Census, Deerfield Twsp., Livingston Co., MI, p. 459, dwelling 1946, family 1950, M432, roll 356; 1860 U.S. Census, Deerfield Twsp., p. 158, dwelling 1190, family 1183, M653, roll 552; 1870 U.S. Census, Deerfield Twsp., p. 25, dwelling 192, family 191, M593, roll 687. 9. Philip Livingston. DAR, Rural Cemeteries of Livingston County, Michigan, Vol. 2. Howell, Mich.: DAR, 1948:28. 10. Father Patrick O’Kelly, The Baptismal & Matrimonial Register of the Congregations of … St. Andrews-Deerfield, MI …(LDS Film #0014823, item 11). 11. “Doherty,” May Rockwell Howlett Collection, Box 4, Folder 15, Oakland County Pioneer and Historical Society, Pontiac, MI. 12. SS Victoria Passenger Manifest, 3 May 1834, p. 4, Passenger and Crew Lists of Vessels Arriving at New York, 1820-1846; M237, roll 22; National Archives. 13. Edmond, Nicholas and James Doherty, final certificates 10954 and 10955, General Land Office, Detroit, 3 August 1839. 14. U.S. to James Doherty, Oakland Co., MI, Deeds, v. 35, p. 443, LDS film #0975575, and James Doherty to Farrell and Forrey, Oakland Co., MI, Deeds, v. 14, p. 578, LDS film #0975566. 15. Cecil Eby. “That Disgraceful Affair,” The Black Hawk War. New York: W.W. Norton & Co. Inc., 1973:13-14. 16. James Doherty enlistment paper, Enlistment Papers, United States Army, Box 200; Register of Enlistments 1835-39, Roll 20, #101, M233; “Semi-Annual Muster Roll of Company H, 5th Infantry Regiment, 31 December 1837 to 30 June 1838,” Regular Army Muster Rolls, Inspection Returns 1821-60; all in RG 94, National Archives. 17. Michael J. Watts and Christopher T. Watts. My Ancestor Was in the British Army. London: Society of Genealogists, 1995: 10; John Doherty, 8 October 1801, British Army, WO 31/116; Ensign John Doherty, 28 August 1802, WO 31/121; Lieutenant John Doherty, 31 December 1803, WO 31/154, Public Records Office, Kew, England. 18. 49th Regiment of Foot, WO 380/1, p. 141; Colonel W. L. Vale. History of the South Staffordshire Regiment. Aldershot, England: Gale & Polden Ltd., 1969:31.; Capt. Thomas Evans’ Company, 1st Battalion, 38th Regiment, WO 12/5180, 25 December 1804-24 August 1805; 38th Regiment, WO 380/1, p. 119; 2nd Battalion, 38th Regiment, WO 17/148, 1 November 1805-1 February 1806. 19. Martin J. Blake. “Pedigree of Lynch of Lavally, County Galway.” Journal of the Galway Archaeological and Historical Society. (1918): 66-69. 20. A List of All the Officers of the Army and Royal Marines on Full and Half-pay, 54th ed. (London: War Office, 1806). 21. Edmund O’Doherty. “Parish of Cashel Baptismal Register Cash 120.” record 2043, Tipperary Heritage Unit, Tipperary, Ireland. 22. Tithe Applotment Book, Tipperary South 93/186, 1 Nov 1825, film 99; Griffith’s Primary Valuation, County Tipperary South Riding, Barony of Middlethird, August 1850, fiche 9; Stephen McCormac, comp. Tithe Defaulters Ireland, 1831, Tipperary. Victoria, Australia: Data Tree Pub., 1998. 23. National Commercial Directory of Ireland. 1846; London: Society of Genealogists, 1993:165.; John Farrell to Mary Farrell Cleary, 19 April 1922. 24. Richard J. Hayes, ed. Manuscript Sources for the History of Irish Civilisation. Boston: G.K. Hall and Co., 1965. 25. O’Docherty Pedigree, Manuscript 175 (Genealogical Office of Ireland), p. 360. 26. Margaret Doherty, “Parish of Cashel Baptismal Register Cash 170,” record 4934, Tipperary Heritage Unit, Tipperary, Ireland; Carroleus Doherty, “Cahir Parish Baptism Record Register 2.” p. 208, Br— Borœ Heritage Centre, Cashel, Ireland. 27. Sister Mercedes Lillis. “The Story of the Ursulines of Thurles.” Two Hundred Years Agrowing, 1787-1987. Roscrea, Ireland: J. F. Walsh Printers Ltd., 1987:15.